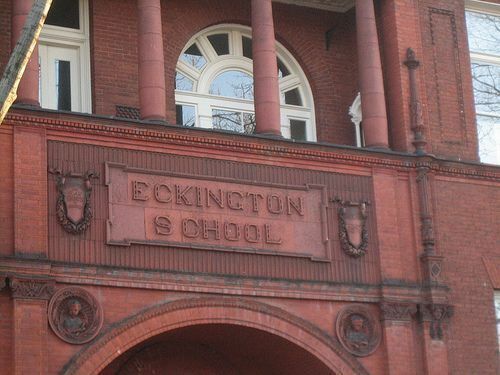 Eckington is a neighborhood in Northeast Washington, D.C., located south of the Prospect Hill and Glenwood Cemeteries. Though being one of the first neighbordhoods in DC, Eckington still hosts a good mixture of modernized and traditional homes: row houses, industrial buildings, etc along the east of North Capitol Street. Eckington is also the home of the District of Columbia office of Sirius XM Radio. 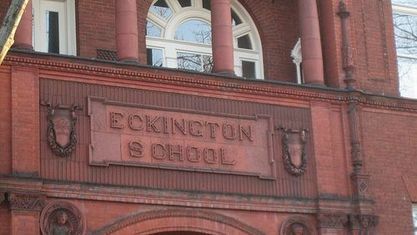 Eckington is less than one mile (1.6 km) southeast of Howard University and exactly one mile north of the United States Capitol. The boundaries of Eckington are Rhode Island Avenue to the north, Florida Avenue to the south, North Capitol Street to the west, and Washington Metro‘s Brentwood Yard to the east. The land which became Eckington was the country home of Joseph Gales, Jr., owner of the National Intelligencer newspaper and Mayor of Washington from 1827 to 1830. Gales named his estate Eckington after The Village in England in which he was born. During the American Civil War, the house was used as a hospital for the 7th Regiment of New York. After the war, Eckington, commonly known as Gales Woods, was a popular picnic ground. According to the Evening Star newspaper, February 25, 1934, “immense cans of ice cream and barrels of lemonade were always on hand to refresh the children with, when they were tired out from running in the woods, playing games and swinging in the grapevine swing”. In 1887, Eckington was bought by George Truesdell and his wife Frances, who subdivided the property, improved it substantially for habitation, sold lots, and built several houses. Truesdell undertook extensive grading operations to level the landscape of his 87-acre Eckington subdivision. Truesdell erected five “pretty cottages” which, according to an 1888 newspaper account, were “all fitted up as city houses,” with steam heat and hot and cold running water. Eckington was wired for electricity in 1889, two years before electricity was installed in the White House. From 1889 to 1897, Lane developed nearly twenty properties in Eckington. None of Truesdell’s original five houses exists today, although several detached houses from the late 19th century, by Lane and others, dot the streetscape of Eckington. The first three decades of the 20th century brought a boom in rowhouse construction to Eckington, as it did in many parts of the District. The Eckington & Soldiers Home Railway Company began service on October 17, 1888. It was Washington’s first electric railway and followed by just a few months the first practical electric railway in Richmond, Virginia. The line ran from Seventh Street and New York Avenue NW to Fourth and T Streets NE in Eckington, then was extended in 1889, up Fourth Street to Michigan Avenue and The Catholic University of America. Col. Truesdell’s subdivision straddled the narrow tracks of the Metropolitan Branch of the B&O Railroad. The Met Branch was a line which brought commuters into the city from Maryland beginning in 1873. In 1888 the B&O bought 13 acres just north of Florida Avenue and built a passenger station. Passengers were to disembark and ride the new electric line into the city. A few years later the B&O built a huge freight depot next to the passenger station. This freight center spurred the development of manufacturing and warehousing along the west side of the tracks from Florida Avenue north to Rhode Island Avenue, Truesdell’s covenants notwithstanding. The National Biscuit Company (Nabisco) was at 4th and S Streets and Judd and Detweiler printers was at Florida Avenue and Eckington Place. Although the streetcar had been a community center for both Eckington and Bloomingdale, the adjacent neighborhood to the west, after the streetcar line was removed in the 1950s North Capitol Street was dug into a trench to facilitate high-speed, high-volume traffic. The entrenched highway created a stark separation between Eckington from Bloomingdale. North Capitol Street remains noisy and difficult to cross; this, along with the railroad tracks on its east, gives Eckington its relatively isolated quality. Get to know Eckington better with our featured images and videos.